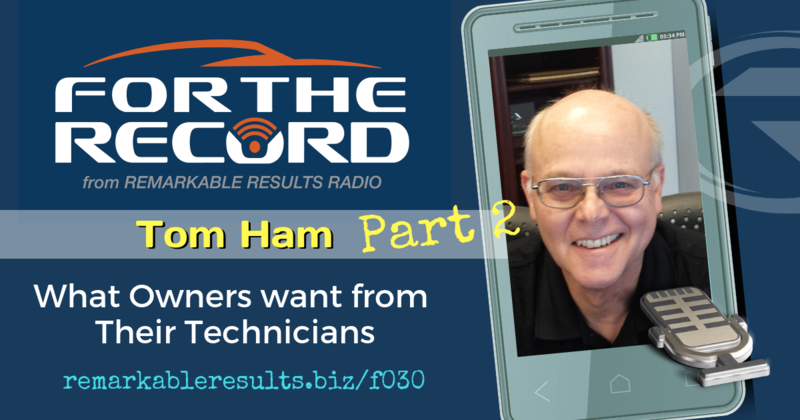 Tom Ham, with the help of his wife Deb, is the creator and owner of Automotive Management Network a 12,000 plus member website dedicated to the exchange of vehicle service management information. Tom got his start in the auto service industry pumping gas in the late ’60s. Tom and his wife operate Auto Centric, an import specialty shop in Grand Rapids, MI. Tom and Deb have five children including two sons and a daughter who served in the Iraq War as U.S. Marines. He writes extensively on industry topics. Discover Tom’s previous episodes HERE. Look your best. Your appearance is the price for admission to the professional world. Maintain a clean drivers license. Show up every day on time. Ideally a little early. Constantly improve your diagnostic ability. Be clean. Work Clean. Like a formula one shop. Take care of our equipment and facility. Provide constructive input to me. Show respect. If you want respect, show it to others. A special thanks to Tom Ham for sharing his passion – For The Record.